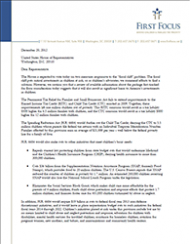 This letter, sent to all members of the House of Representatives, contains an analysis of the Permanent Tax Relief for Families and Small Business Act and the Spending Reduction Act (H.R. 6684). Both items will be voted on Thursday, December 20, 2012. The analysis warns members of Congress that these bills will cause an increase in child poverty and jeopardize key investments in children.